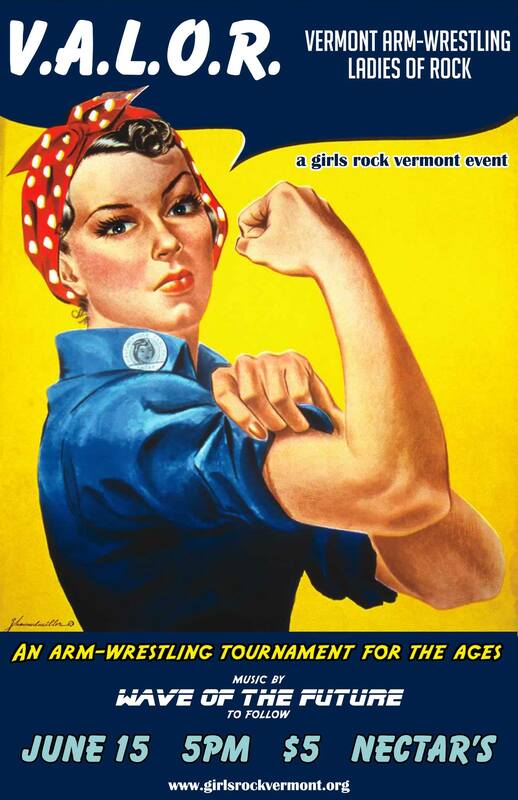 Events – Girls Rock Vermont! This is a spectacle not to be missed! Eight strong-armed women costumed as their wrestler alter-egos will compete in a double elimination style tournament to raise money for our summer camps. We will also be collecting instrument donations for camp, so feel free to bring down that bass guitar, drum-kit, keyboard or mic that needs a good home! We will gratefully accept them at the event! Following the tournament there will be a rockin’ set from the Burlington based sci-fi-dance-punk band Wave of the Future ~~~ stick around for the dance party! It’s not too late to sign up to compete! You just have to be a brave woman at least 18 years old who isn’t afraid to dress in costume and arm wrestle in front of people! No professional experience necessary, this is all for fun!